Douglas Rushkoff has been an authority on the intersection of technology and culture since before the word “google” was anything more than baby talk. He predicted the coming centrality of the Internet (CYBERIA, 1992 – by the time it came out); he coined the terms “viral media” (MEDIA VIRUS, 1994) and “social currency” (Upside Magazine, 1996); he fore-casted the collapse of the dotcom bubble (SXSW, 1997) and the most recent recession in a 2004 column that later became his book, LIFE INC; he even inspired today’s code literacy movement (PROGRAM OR BE PROGRAMMED, 2010). He is the author of a total of twelve bestsellers (translated to over thirty languages), the host of three award-winning documentaries, an award-winning educator and frequent media commentator. 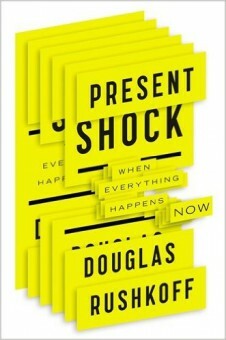 In his new book, PRESENT SHOCK: When Everything Happens Now (Current; March 15, 2013), Rushkoff introduces the phenomenon of presentism, or – since most of us are finding it hard to adapt – present shock. Alvin Toffler’s radical 1970 book, Future Shock, theorized that things were changing so fast we would soon lose the ability to cope. Rushkoff argues that the future is now and we’re contending with a fundamentally new challenge. Whereas Toffler said we were disoriented by a future that was careening toward us, Rushkoff argues that we no longer have a sense of a future, of goals, of direction at all. We have a completely new relationship to time; we live in an always-on “now,” where the priorities of this moment seem to be everything. Narrative collapse – the loss of linear stories and their replacement with both crass reality programming and highly intelligent post-narrative shows like The Simpsons. With no goals to justify journeys, we get the impatient impulsiveness of the Tea Party, as well as the unbearably patient presentism of the Occupy movement. The new path to sense-making is more like an open game than a story. Digiphrenia – how technology lets us be in more than one place – and self – at the same time. Drone pilots suffer more burnout than real-world pilots, as they attempt to live in two worlds – home and battlefield – simultaneously. We all become overwhelmed until we learn to distinguish between data flows (like Twitter) that can only be dipped into, and data storage (like books and emails) that can be fully consumed. Overwinding – trying to squish huge timescales into much smaller ones, like attempting to experience the catharsis of a well-crafted, five-act play in the random flash of a reality show; packing a year’s worth of retail sales expectations into a single Black Friday event – which only results in a fatal stampede; or – like the Real Housewives – freezing one’s age with Botox only to lose the ability to make facial expressions in the moment. Instead, we can “springload” time into things, like the “pop-up” hospital Israel sent to Tsunami-wrecked Japan. Apocalypto – the intolerance for presentism leads us to fantasize a grand finale. “Preppers” stock their underground shelters while the mainstream ponders a zombie apocalypse, all yearning for a simpler life devoid of pings, by any means necessary. Leading scientists – even outspoken atheists – prove they are not immune to the same apocalyptic religiosity in their depictions of “the singularity” and “emergence”, through which human evolution will surrender to that of pure information. With PRESENT SHOCK, one of the world’s leading media theorists gives a name and shape to the character of the new millennium. “Present Shock” is one of those invaluable books that make sense of what we already half-know….Your new boss isn’t the person in the corner office; it’s the P.D.A. in your pocket. “I am much less concerned with whatever it is technology may be doing to people that what people are choosing to do to one another through technology,” Mr. Rushkoff writes. “Facebook’s reduction of people to predictively modeled profiles and investment banking’s convolution of the marketplace into an algorithmic battleground were not the choices of machines.” They were made by human intelligence, because present shock’s ways of targeting, pinpointing and manipulating aren’t just shocking. They’re very lucrative too.